One of the best things about being a gardener, up there with cake and unusual suntans, is the propensity of fellow gardeners to share. It could be plants, cuttings, seed, even advice. It is a knee jerk reaction to admiration of handiwork, can occasionally become an obsessive trait, it is what we do, we like to “pass it forward”. A few weeks ago we were visited by Torrington Tina and her husband, an appreciative and knowledgeable partnerhip. She left with some cuttings of myrtle and salvia in her handbag and promised to return with a special euphorbia that she had in her possession. 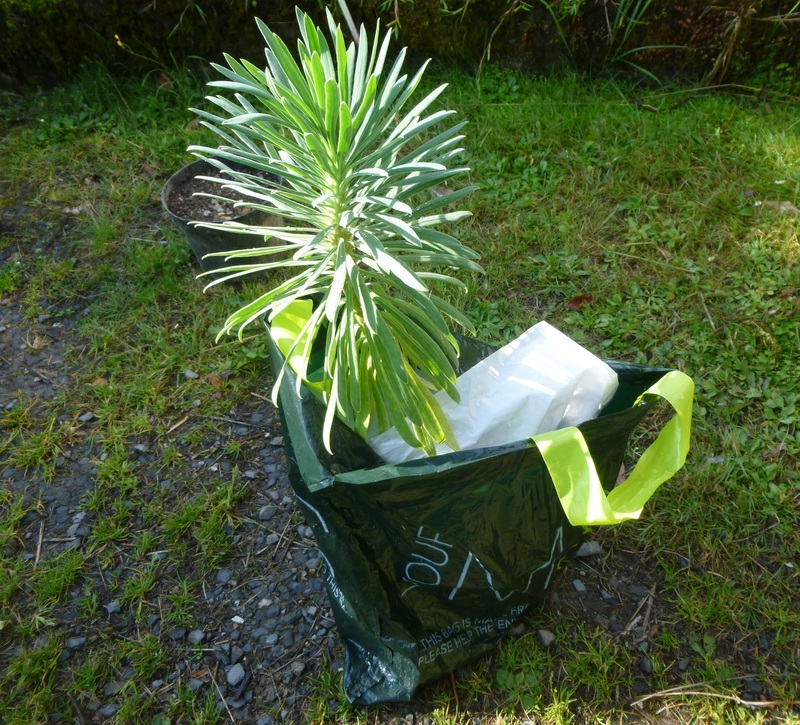 This morning I was thrilled to find at the bottom of the potting shed steps, in a rather high quality plastic bag*, a wonderful specimen of Euphorbia characias ssp. wulfenii. So kind, thank you very much it will be very happy here. Pass it forward = PIF? This is a term that I have only come across on shaving forums (Yes, you can get forums dedicated to men shaving, those shiny double edge razors are just so shiny and those badger hair brushes are full of body…). Sorry, I digress, what a lovely surprise you received this morning. I like Euphorbia and recently I was after a wulfenii, but my local nursery only had black eye in stock, I guess that it is similar, but smaller. Gardeners get that give-away tan line at the back between top of shorts and start of t-shirt! Shaving forums interesting……..
Ah – it will be a very happy plant at Cliffe! You just can’t go wrong with a nice Euphorbia, can you? I’m liking them more and more every year. You’re right, gardeners are lovely people. My sweetheart is a great believer in passing along a plant. He even once rooted a sprig of rosemary used as garnish on a meal. What a lovely thing to do, he sounds like a good ‘un! © Gill Heavens and ontheedgegardening, 2012. Unauthorized use and/or duplication of this material, text or photograph, without express and written permission from this blog’s author and/or owner is strictly prohibited. Excerpts and links may be used, provided that full and clear credit is given to Gill Heavens and ontheedgegardening with appropriate and specific direction to the original content. The Writers diary, Photography, Articles, Random Stuff. Curious considerations and rambling reflections on the subject of food.